Seagate harvests giant the kelp, Macrocystis pyrifera, along the west coast of Baja California, primarily along the bays within a 20 miles of Ensenada. Seaweed has been a part of Seagate’s fishing and marine harvesting program since 2003. It is one of 18 raw materials that Seagate produces. Until November 2011 consumer demand for seaweed was slow but regular. 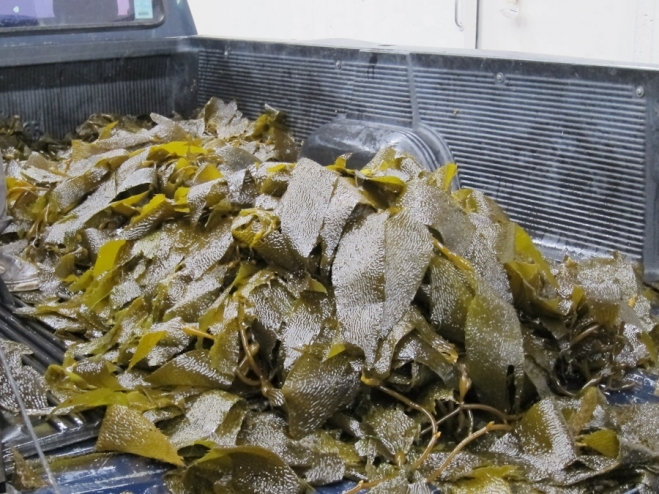 Seagate divers would cut approximately 5 to 10 tons of seaweed per year for freeze-drying, with production keeping pace with demand. Things changed dramatically after a Dr. Oz television show in November 2011 when he mentioned the many benefits from taking seaweed daily. For the next 4 months, demand skyrocketed. Some individual stores were placing orders for 1,000 bottles each week. At that time, Seagate’s production level was 1,000 bottles per month. Only a small fraction of those orders could be filled. It was not possible to increase production until the Spring of 2012. Winter Pacific swells and storms off the coast of Baja California limited kelp harvesting by the divers. Since March, Seagate has had 3 divers working full time hand-cutting the and delivering the kelp increasing production by a factor of 10x. Although demand for the bottled seaweed has fallen from the mid-Winter consumer frenzy, it has remained strong and steady. Thank you Dr. Oz. Radiation in a capsule? Not in Seagate’s Seaweed. The March 2011 Fukushima nuclear disaster sent an estimated 11,500 tons of contaminated water containing high levels of radiation into the Pacific waters of Japan. Probably the amount of seawater discharged has been many times this original estimate. Obviously, the possible impact could be devastating. Any marine life in contact with this irradiated water will also become radioactive. The Pacific Ocean flows clockwise in the northern hemisphere. Seawater along the coast of Japan flows northeast along the Pacific coast of Russia, across to Alaska and then down the west coast of Canada, the U.S. before finally reaching the coast of Baja California. The theoretical transit time for a molecule of water originating in Japan and traveling 10,000 miles to reach the area of Seagate’s seaweed harvesting is 1 year. Radioactive water from Fukushima would have reached Baja California by April 2012. Seagate performs a series of quality control tests on their raw materials prior to bottling each batch. Each batch of seaweed powder is now tested for radiation levels. A copy of the most recent independent lab report analyzing Seagate Seaweed Lot # 11 is provided by clicking the link below. Lot # 11 contains all the seaweed powder processed by Seagate between March and June 2012. The results of the lab analysis show zero radioactive isotopes detected. Of particular interest was the possibility of radioactive isotopes Iodine-131 and Cesium-134 which were both released at Fukushima. Seagate’s kelp contains naturally-occurring iodine, which is a beneficial element absorbed by the thyroid, except of course if it were radioactive. 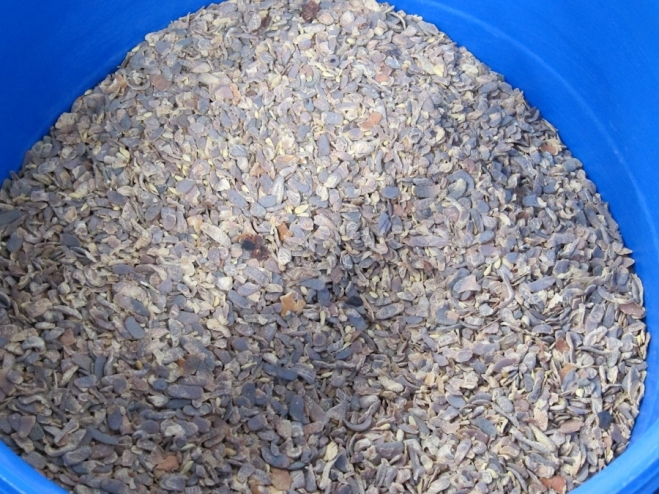 1) Dilution – While 11,500 tons of radioactive water is an unprecedented level and locally along the Japan coast will destroy their fisheries and seaweed for many years, the dilution of this amount of water by the Pacific Ocean can make the radiation levels undetectable by the time the currents reach Southern California. 2) Corriolis Effect – As a current of water moves along the coast of California, the rotation of the earth causes the current to bend to the right. This corriolis effect causes the California Current that runs southward along the Canadian Pacific and U.S. Pacific Coast to bend away from the continent and go west towards the center of the Pacific Ocean. By drawing all of this water away from the coast, this creates areas of upwellings, where cold water from the bottom are drawn up to the surface to replace the water curving offshore. Therefore, this corriolis effect can replace most of the original radioactive water molecules that have traveled down from Alaska, with clean, cold, nutrient-rich waters from the bottom of the Pacific Ocean. So far it appears likely that the irradiated waters have been diluted and pushed offshore towards the center of the Pacific Ocean. Eventually the radiation will spread out but also will become so dilute that it likely will not be detectable in the ocean. Seagate will continue to closely monitor and test the raw materials that it harvests from the Pacific, especially its seaweed. 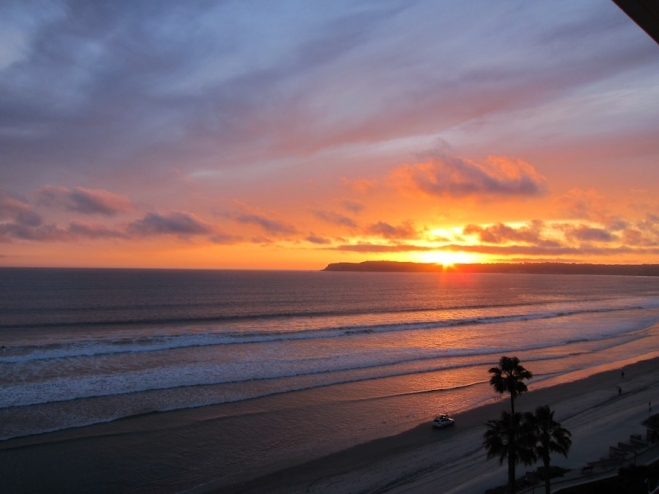 Seagate’s picture of the week is a sunset in San Diego over the Pacific Ocean, behind Pt. Loma. Roni - Thank you for testing your products for radioactive contamination! My concern is that other companies may not be testing their produce! Testing for radioactive fallout should be mandatory in this day and age, and as you correctly point out, things can get a lot worse, with Fukushima’s policy of releasing tons of radioactive water into the ocean each day in an effort to contain and clean up this disaster. They are also incinerating radioactive waste on a daily basis, and this is polluting the atmosphere far and wide with raidoactivitgy that won’t go away. This must be stopped and it takes a world wide effort to help as Japan can’t manage this enormous task alone. God help us if there’s another earthquake in Fukushima. We send out seaweed out to an independent laboratory to test for radiation. It is fairly expensive to do. However, since we are not a laboratory we cannot accept samples of other seaweeds for testing.